A creative and crafty place to share unique, alternative, and altered projects using rubber / digital stamps and inks. 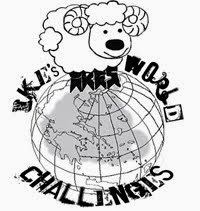 Be sure to enter into this round of Ike's World Challenges. Challenge #36 is No Patterned Paper. Good luck and a shout out to all of those who birthday is today! I just so happened to get my Part 1 done over at Sparkle and Glitter the Rick St. Dennis EDT Blog in March for the Progressive Challenge that happens for 2 months. And, was able to get Part 2, for April, done as well...woooohooooo for me! It is a first! For those of you who do not know, for Part 1 you must enter the challenge using one of Rick's super incredible images. There are over 1,000! And for all types of creativity as well. For Part 2, if you get your project in on time, you get a FREE image to use for Part 2. This month was a sweet little thang named Aloha Nui. I love going to the dollar store and found these magnet boards for sale. Of course had to buy a bunch and have used....3, including the project for this challenge. So what if I've had them over 4 years...THEY ARE GETTING USED! Image was printed onto Whisper White card stock. She was colored in with Copic's and Spectrum Noir's. Only her body was gone over with Crystal Effects. Hard to see but light glitter on the flower ends in her hair. She was fussy cut and made into a magnet. I used Holtz Butterscotch Alcohol ink and blender tool with a The Crafters Workshop stencil for yellow design in upper left area. Another The Crafters Workshop stencil to make the circles with a green Spectrum Noir marker. Flowers are stamped with Ranger Black ink and are from a SU! set called Everything Eleanor. They are colored in with a blue Spectrum Noir marker. Yellow flowers are stamped with Yellow StazeOn ink. Stamp is from SU! set called Summer Silhouettes. Orange StazeOn ink stamped with stamp from set called Gorgeous Grunge (SU!). Forest Green StazeOn ink used with an edging stamp (along right side) from SU! set, Chalk Lines. The word 'month' and days of the week gone over with dark grey Spectrum Noir marker. Magnet from stash and used Sticky Strip to hold in place. Labels: Aloha Nui, Left Of Center #73, magnet board, Rick St. Dennis, SBBC #75, Sparkle & Glitter RSD April 2015, Stampin' Up! Ike's World Challenges is onto Challenge #35 - Things With Wings. Join in and enter your winged project to win! Please see what the WEEK 2 projects are and get inspired. For this challenge I have used many images from Ike's and you can find them at Ike's Art. Ike is so nice that we, the DT, get some images that have not been released yet. So do not fret, they may pop up in the store or can be a FREEBIE that Ike offers with each challenge. Don't miss out! Images you can find in the store on my scrapbook page are FACE ON, BOTTLE 4, and THOUGHTS. Images that I have also used are Witches Cauldron and Not The Sistine Chapel Hands. Page is from Me & My Big Ideas. Those witches crack me up! All images were printed onto Whisper White card stock. Each was fussy cut and pieced together. Markers, inks, Aqua Painter, and Copics were used to color in images. Gold Smooch was spritzed onto the swirl coming out of the cauldron. Words were redone in Word, printed out, cut out, and adhered to page. Marker used to help define. The project featured at Smudgy Antics is a Tag. Please be sure to check daily for some amazing work by the Smeared Ink Design Team. Tag is made from Smeared Ink's digital and rubber stamps. Image is called Eye Ball-ble and is a digital image. Back of image I have used a stamp from the January Rubber Club stamp set called Letterbox Backgrounds. Saying is also from a Past Rubber Club Stamp set called Creepy Li'l Grumpies. Colored in with Copics and markers. Crystal Effects on eye center and drips. Background was stamped with Smoky Grey ink. Edges are sponged with Black ink. Saying was also stamped with Black ink. Hole was punched with Crop-a-dile. Black plastic was from the glow sticks that you get at Halloween. Ribbon is Cherry Seam Binding. Basic Black card stock is the backing. 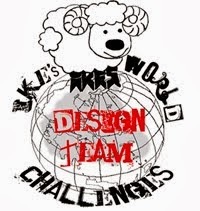 I was not quick enough to get my project for TEAM B in over at Ike's World Challenges. The current Challenge #33 - Colored Hair will be closed soon, so use that FREE image and get your project entered! I have used the image called KT Frock which was a FREEBIE from Challenge #17. So don't miss out on some wonderful images. You can also see what else Ike has to offer from Ike's Art. I just love seeing how freaked out the kids get at the Egg Hunts each year. So this little one is just about as freaked out as you can get! I have made a calendar page using a digital image from the set called Daemon Horses, a digital paper from the set Honor The Dead, and a rubber stamp from the set Urban Decay. Please see daily inspiration over at the Smudgy Antics blog and if you happen to use any Smeared Ink images in your projects be sure to enter the month long Smudgy Antics Challenge - Anything Goes. Smeared Ink is so lucky to have many wonderfully talented artists as part of the image team. This image was done by Susan Eisenhauer, aka Ike. I recently went to Phoenix for a get away with some friends and now find myself playing catch up once again. This post is for a Smudgy Antics post that was done on March 11th. The inspiration for this page was inspired by Edgar Allan Poe and a challenge that was based off one of his works. Quoth the Raven, Nevermore has month long challenges. I will be entering this into Quest #42 - Dream On. I have used both digital paper and stamps on this page. The main image is from the digital set called Death Cab. The digital papers on the background are from Poe Boy and Vintage Grunge. Stamps are a set from the Rubber Club Past Offerings, Quoth The Raven. That my days have been a dream..."
I love creating all kinds of crafts. Stamping is my main foucus and that is what this blog is about. I am a Stampin' Up! Demonstrator, over 6 years, but want to do more with alternative stamps and products. The majority of the card stock, accessories, and supplies are Stampin' Up!. There will be scrapbooking, cards, and projects...but with a dark side. So enjoy, have fun, and go create!